A look from the D&G Spring 2008 runway & a budget-friendly way to make the look your own from Indo Chic Designs. For spring, Dolce & Gabbana apparently had a free-love bohemian on the brain, albeit a fashionable one. 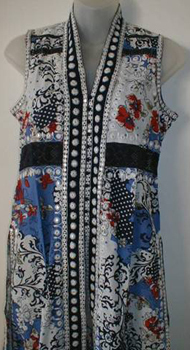 This beaded tunic can just as easily be worn over jeans as dressed up for an evening out. Available at IndoChicDesigns.com. Top 10 Pantone fashion colors for Spring 2008. The most interesting trends from New York Spring 2008 Fashionweek.